There is a strange affliction that has come into our home. Its origins are not well known but the course of the disease has been well documented, especially in the last 20 years. It’s a stubborn and pesky bug which can ruin a family dinner as easily as it can an afternoon of fun. What is this unwelcomed invader? It has many names, but we have affectionately named it OC (T) D – Obsessive Compulsive Thomas Disorder. For those without preschool age boys (boys are far more afflicted with the disease than girls although it can occur but usually to a lesser degree) you may be only vaguely aware of the Island of Sodor and its bevy of animated mechanical inhabitances (strangely, there seems to be many more machines than people on the island, but that will need to be a different writing). 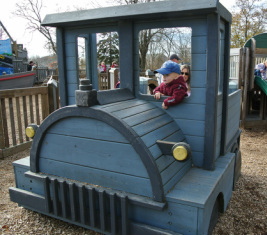 Most populous on the island are its trains lead by the “cheeky” number one train Thomas. He’s a cute blue steamy (nickname for a steam engine) who generally reminds me of a young boy as he is impulsive, overachieving (I can do it) and competitive (I can go faster/ carry more than you). Thomas is regularly getting into trouble for not minding his work and trying too hard to help or to compete with other trains. I often wonder why Sir Topham Hatt keeps him employed, but as it’s a preschool show, problems always work out in the twelve minute time frame and everyone remains friends. My older son started watching Thomas about 8 months ago and within roughly 20 minutes of the initial viewing the obsession had taken hold. Thomas is the standard against which all other activities are measured. We talk about Thomas, we play with Thomas, and we sign about Thomas. Never in my life would I have thought my husband would be signing the theme song to a kids show, but he is a boy at heart so I think there is a genetic predisposition there. Thomas is both the sun and the moon to my almost 3 year old. Two days ago I was in the room with him as he was watching an episode. He sat on the couch excited for its beginning and remained enthralled as it progresses (thank goodness they are short On Demand). He giggled and laughed at moments only possibly deemed funny by the preschool set. You can’t talk to him when he is watching and his little brother better be careful if he ever accidentally turns off the TV. Will’s Thomas collection is not as big as many I’m sure, but to him it’s everything. He has books, DVDs, puzzles, flash cards, and flatware. I try to keep out the clothing and décor. His train table is of course filled with residents of Sodor and we currently house at least 15 different Thomas trains. Thomas is a merchandising juggernaut. You can strongly see the true obsessive power of Thomas when one of these connections is not available to him. He can quickly erupt and turn into one of those toddlers we are always afraid of ours being when we are out in public. Will analyzing the tunnel traffic! Getting to work on the next indoctrination. Last week Will decided he wanted to use his Thomas fork for dinner. “Not possible” we told him as it was dirty. “No it’s not dirty” came back at us, multiple times and at an increasing rate, volume and pitch. Forget that he had used it for breakfast that morning, that fork had to be available to him pronto. He, as impulsive preschools do, asks to see Thomas as soon as the light hits his eyes in the morning and/or as soon as he walks in the door in the afternoon (he can only watch one a day). Threats to prevent him from watching are met with tears and hysterics. We had to put our foot down as he was hysterical when they ended and let him know if the crying continued, that would be the end of Thomas watching, it stopped. Thomas the Tank Engine may be more important to him than us. Its only limitation so far seems to be its lack of motivation to use the potty. Yep, I have offered more TV time if he’d just use the potty, so far no luck so maybe there is hope for him after all – but not apparently for me. I realize this obsession with Thomas won’t last forever and in a few years when his face is stuck just inches away from a portable game devise I will wish back for the days of singing at the dinner table, even if it’s the same silly theme song over, and over, and over again. They’re 2, they’re 4, they’re 6, they’re 8, shunting trucks & hauling freight…….